The world has become obsessed with the Western notions of progress, development, and globalization, the latter a form of human and economic homogenization. These processes, through the aegis of the United Nations, are comparatively monitored. Those nations deemed to be ‘lagging behind’ are then provided with foreign aid and developmental assistance. For nearly seventy years, India has sought its place in this global endeavour; yet, even today, abject poverty and backwardness can be observed in districts in almost every state; with the highest concentration of such districts found in the state of Bihar and a cultural enclave, known as Mithila. Development in India has been elusive because it is difficult to define; and because the Western concepts of development and progress have no absolute equivalents within many non-Western settings. As a consequence, development programmes often fail because they are unable to ask the right questions, but equally important is the political economy derived from foreign aid. For politicians, there is no long-term benefit to be derived from successful development. In general, foreign aid only serves to corrupt governments and politicians and, in the end, does very little for those who need help. The struggling states of Bihar and Mithila serve as extreme examples of India‘s problems. Development here has been thwarted by a hereditary landed aristocracy supported by religion, casteism, custom, social stratification, tradition, and patterns of behaviour that can be traced back millennia. In turn, all these have been masterfully manipulated by co-opted politicians, who have turned politics into a veritable art form as this volume comprehensively demonstrates. 1. Development and Backwardness: What are they; How do we Deal with them? 2. 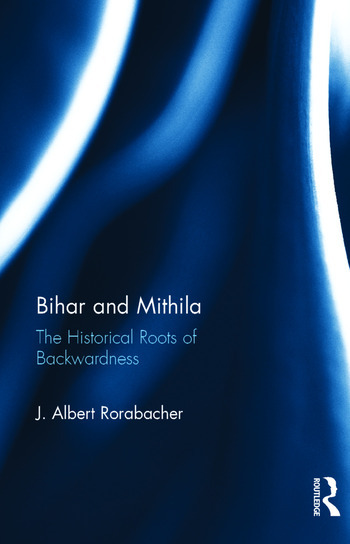 Bihar and Mithila: What Went Wrong? 3. The Environmental Roots of Backwardness in Bihar and Mithila, Part I: Floods 4. The Environmental Roots of Backwardness in Bihar and Mithila, Part II: Drought 5. Orientalism and India’s Gordian Knot: Religion, Secularism and Caste 6. The Darbhanga Raj: The Heart of Mithila 7. Pulling the Threads Together 8. Some Final Thoughts and Observations 9. Postscript: The 2014 Lok Sabha Elections in Bihar: What Happened and What it Means? John A. Rorabacher has taught at the Universities of Texas (Austin); Wisconsin (Green Bay); Minnesota (Minneapolis) and South Dakota State University, as well as working in the private sector as a consultant. He is now retired, residing in Barrie, Ontario, Canada with his wife, Hava, and continues to write on the topics of hunger and development, flooding, land relations, and development in India.